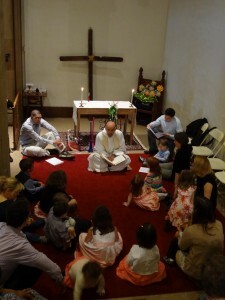 Each week we gather for a worship service designed for children from roughly 2-7 years old. The service is brief (30 minutes), hands on and interactive, while still covering the basic elements of worship and prayer. Come with your entire family to enjoy this close up version of our 10:00 a.m. service. For more information, please click on either The Rev. John Mennell or Director of Family Ministries, Kathy DeWalt below. Click on picture to contact Kathy DeWalt to learn more about the “Celebrate” Service. Click on picture to contact The Rev. John Mennell to learn more about the “Celebrate” Service.